A total of over 140,000 gamers worldwide have now completed the Gamer Motivation Profile. Statistical analysis of how motivations cluster together is consistent with what we reported earlier. Want to know how you compare with other gamers on these motivations? Take a 5-minute survey and get your Gamer Motivation Profile. 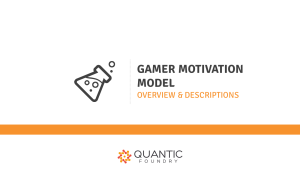 To make the Gamer Motivation Model easier to understand and share, we’ve put together some reference charts and slides. First, we have a chart that lists all the motivations and how they are related. Motivations in the same column are more highly correlated than motivations in different columns. The chart also provides brief descriptions of each motivation. 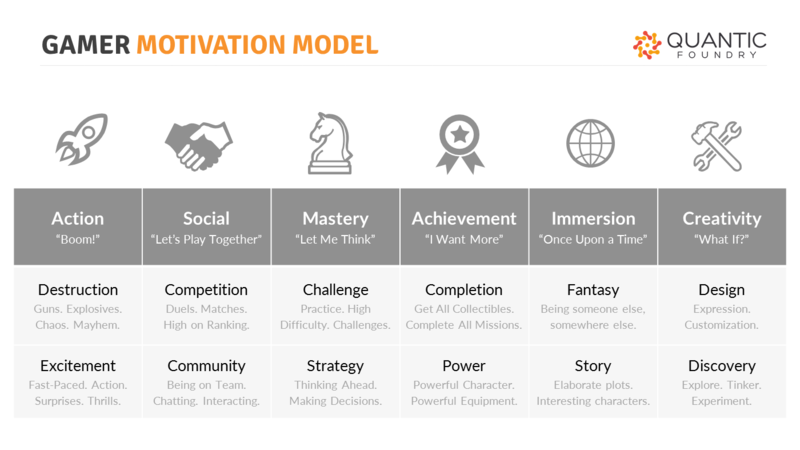 Second, we have a short set of PDF slides that provides the chart and more detailed descriptions of each motivation along with game examples. Click the image below to download the PDF. We have some really exciting findings we’ll be sharing in the coming weeks (e.g., a higher-level visual map of all these motivations), but we wanted to make sure we laid the groundwork for the describing the model before diving too deep in the data. This is a very impressive segmentation of gamer motivations. I’m excitedly looking forward to what is to come. This is super interesting and I was able to more or less identify myself and some of my friends using this framework. The rough categories do seem to correlate well with what I perceive to be their game preferences. Fantastic Work! I am going to be digesting a lot of information from your site. Disappointed to find out this was about video games. I find tabletop gaming vastly more worthwhile and enjoyable, and at first glance I thought the categories you laid out were based on board game categories. Perhaps you, or someone else, could expand this model to include all of gaming, not just the video subculture? Have you seen the players segmentation from Piwag, based on 70 motivations? It sounds way more complete to me. What do you think about it? Do you have a link to these 70 motivations? I’m seeing laundry lists of game feature tags in their video, but isn’t this already what Steam does (http://store.steampowered.com/tag/)? And fundamentally, it’s easy for gamers and game dev to brainstorm large laundry lists of game features. The hard part is figuring out whether there’s a more parsimonious structure underlying the list. I was about to searching for them, glad you remind me their video. You can see them here https://youtu.be/GrbHV99IhhM?t=4m43s in the “Psycographic Criteria” section. Game features tags (like Steam) is the tags section just above. I met them this week in France, they explained the psychographic criteria are the 70+ motivations. In their form I found every motivations of your model, but with more elements. I asked them if they ever heard about your model, they said no. Maybe you should contact them to have more informations, I’m not an expert of this stuff. How much is it about mobile gamers ? Hi Laurence – In our gamer sample (currently over 220,000 gamers), about 36% regularly play on smartphone/tablet. See this page (http://quanticfoundry.com/the-v22-sample/) for more details on the sample. I find this motivational model very practical. It would be quite interesting to know from those 220,000 gamers, what percentage of them is inclined to each motivation. For example 10% of gamers are very inclined to competitive motivations, 45% are very inclined to immersive motivations,..Obviously, the sum of percentages would be higher than 100% as one gamer can be inclined to more than one motivation at the same time. Many thanks. I also agree . Having a segmentation of motivations (ideally a minimal one) is qualitatively interesting . What is quantitatively interesting is an analysis of the repartition of players among these categories . If it exists where can it be found ? And if it doesn’t exist , when will it be done ? We had two slides on this in our GDC 2016 talk, but we never blogged about it specifically. You can find the slides here: http://quanticfoundry.com/wp-content/uploads/2016/03/Gamer-Motivation-Profile-GDC-2016-Slides.pdf. The relevant slides are titled “Primary Motivation” and “Split By Gender”. Note that these shift a great deal depending on the genre. This would definitely be a good topic to blog about. I had forgotten that we never surfaced this on the blog. Hi, I’m the type of person who takes random tests for fun (and getting to know myself better) so I love answering surveys that can help me learn more about myself. And I’m thankful for your studies as these are very helpful now to me as the information you have provided is very useful research material. I love reading psych books for fun and your research topic is fascinating. I recently finished my bachelor thesis and I used as theme of debate the Proteus Effect. I’m still quite new to this concept as I only found the time to study it only half a year. Even so; I like the research you’ve made on it and it is really enlightening! I plan to make take my masters’ degree on something related to the more in-depth area of gaming too – which will happen next year. I took my quiz and I have to say that the results are spot on! They got me 100%.